I’d been hearing about Chez Chartier, a historic 19th century restaurant, ever since moving to Paris. I’d especially wanted to go see the famous cubbies that line the walls. Little wooden drawers marked with numbers, this is where regulars once kept their napkins. Last night, we finally decided to check it out and I’m still trying to decide which was more impressive: the décor, the waiters or the classic French menu. Today it may reach 90 degrees in Paris, and yesterday wasn’t too far behind. The large wooden fans hanging from the restaurant ceiling were working hard as we settled down at our table. Soon as we walked through the front doors, we knew this would be a unique experience. The setting immediately took us back to 1896, when the restaurant first opened: one immense room filled with cream-colored walls, giant mirrors, intricate molding, dark wooden paneling and large chandeliers dangling from high ceilings. In addition to eying the much-awaited napkin cubbies, I also took note of the brass racks above the tables, where clients once placed their hats while dining. Even on a Wednesday night, the restaurant was packed – and very noisy. Be prepared to share a table and chat with strangers – our neighbors happened to be an older Canadian couple on a five-week tour of Europe. It’s cliché to say the waiters were busy as bees, but I really can’t think of a better comparison. Dressed in traditional black vests and long white aprons, they swarmed from one table to the next. Adding to the historic charm and tradition, each one wore a small button sporting a number and scribbled orders down on the tablecloths. At the end, that became our bill: a few chicken scratches on the corner of our table, the items added up by hand! 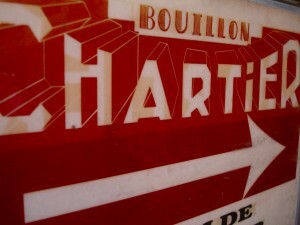 The restaurant’s real name is Bouillon Chartier. 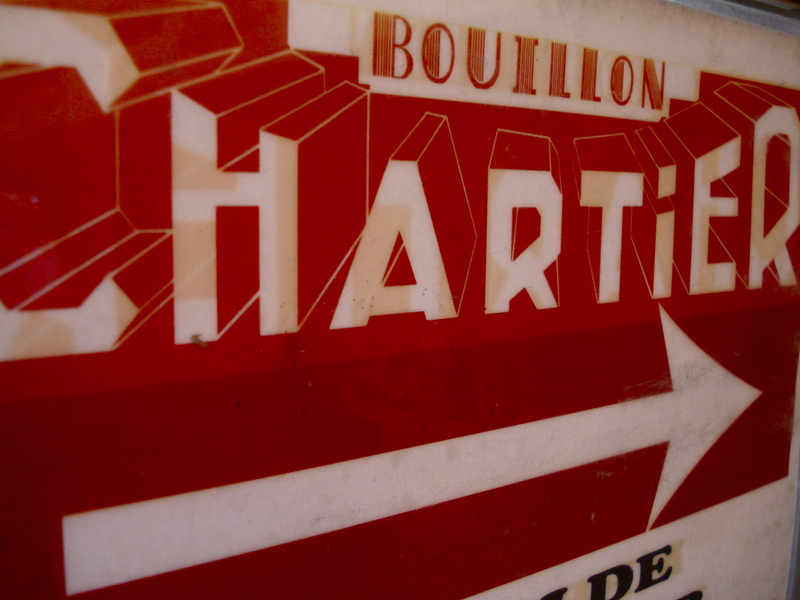 Bouillon means stock in French and comes from when they were known for their inexpensive meat and vegetable stock. In the beginning, the “canteen’s” goal was to provide rapid, modestly-priced meals to regular customers (workers and neighborhood locals). Not much has changed (except the clientele which now comes from all corners of the globe); the no-frills paper menu proposes honest, simple French cuisine at a reasonable price. I chose bar (European sea bass) with boiled potatoes and fennel seeds. Sébastien chose a confit de canard – and a half-bottle of Bordeaux Grave to share – a combination which immediately gave away his Southwest origins and seemed to put us on some sort of special terms with our waiter. Busy as he was, he took care to bring us everything we needed. After dinner, we took a stroll around the neighborhood, which, like the restaurant, takes you back in time. Just across the street is the historic “Passage des Panaramas”, a narrow covered passageway that dates back to 1800. We happily navigated our way around the tiny bistro tables covering remnants of old mosaic tiles. There are also a handful of intriguing shops – like one that sells antique toys, doodads and baby dolls, or parts of them at least. This glass-covered passage was apparently the first place gas electricity was used in Paris back in 1816 and was a popular spot to be seen. Chez Chartier is open everyday from 11:30am-10:00pm. First-come, first served – as they don’t take reservations! We were lucky and didn’t have to wait yesterday, but apparently there’s a line out the door on Sundays. This entry was posted in Restaurant Reviews and tagged restaurants. Bookmark the permalink.